Kilimanjaro's huge snowcapped summit dome, towering above the surrounding savanna, is one of Africa's all-time classic images. The Kilimanjaro massif has an oval base about 40 to 60km across, and rises almost 5000m above sea level. It is the hightest Mountain on the African continent and a must see (or do) for any hiking enthusiast. The 2 main peaks are the KIBO dome and the MAWENZI pinacles. 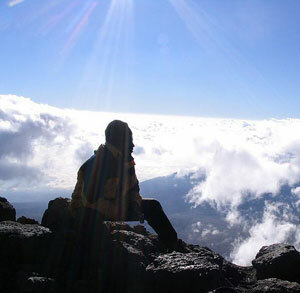 The highest Point on KIBO is the Uhuru peak (5896m). The Highest Point on MAWENZI is the Hans Meyer Point (5149m), but this cannot be reached by trekkers, and is only rarely visited by professional mounteneers. Kilimanjaro is surrounded by dense forest, so to get to the higher moorlands and main peaks you have to follow an esablished route. There are at least 10 trekking routes that begin on the lower slopes but only 3 that continue to the summit. Of these the Rongai Route is the easiest and by far the most popular. A Treck on this route usually takes 5 days/4 Nights for the round trip, although an extra night is reccomended to help acclimatisation. Other routes on Kili are for serious hikers. These usually take 6 days/Nights, but offer a more scenic experience. These Routes include Shira, Lemosho and the advanced Umbwe Route . We do not use the heavily trafficed Machame and Marangu Routes. If you tell us about what you would like to achieve along with any previous trekking experiences elsewhere, our Guides will be able to suggest which route might be most suitable for your group. The number of days quoted for each trek on each of the routes is the usual number most trekkers take. If you can spend an extra night on any of the routes, at about haf way, this will help acclimatisation and will also give you time to see some of the other parts of the mountain. It will also greatly increase your chances of getting to the top.